The Super Jennie Menstrual Cup is in the top 5% of the largest holding capacities of all other products on the market. Both sizes have very large capacities. The medical grade silicone is very soft and comfortable to wear. With proper usage, nothing should be felt throughout the day. Whether a woman’s cervix is high or low, either cup will fit perfectly and never leak. The material is springy, which makes it incredibly easy to fold for insertion. The stem is short and rounded, which makes it very comfortable to wear while making it easy to remove the cup. The sizes of both the large and small cup is a bit bigger than most other offerings on the market. This can be a little strange at first for women who are used to other cups. The instructions included with the box are not a full set. Those must be found on the company’s website rather than getting them with your order. This can cause a slight issue if the Super Jennie Cup is your very first menstrual cup and you’re inexperienced in their usage. The Super Jennie Menstrual Cup is a great option for your period care. Not only is it incredibly comfortable to wear, but the larger capacity means you can go longer without having to empty it out. It’s constructed with medical grade silicone to ensure that it’s always safe and always effective. Since it doesn’t absorb any fluid, you never have to worry about it absorbing any odors. Simply clean it regularly according to the instructions and it will remain smell free. The springiness of the material makes it incredibly easy to insert and remove. Whether it’s your very first cup or you’ve been using them for years, you never have to worry about how it works. There are helpful guides and instructions on the website that you can check out whenever you need. All your questions will be answered. The Super Jennie Cup itself is also very aesthetically pleasing. It comes in three different colors and each one has a fun star design by the stem. The finish is very comfortable and feels good in the hand. Once it’s inserted, you shouldn’t be able to feel a thing. This cup is certainly worth the investment if you want to check it out. It gets high marks on every tier and the reviews are positive across the board. If you want a cup that you can wear all day long without having to worry about it, then this is going to be your best bet. This Super Jennie Menstrual Cup Review will focus on everything that the product has to offer. From the technical specifications to the feel of all day wear, every aspect of the product will be inspected for your edification. Once you read all the information, you’ll be able to make an informed decision on whether or not this cup is for you. There are many cups on the market, but this has one of the highest capacities that you can find. It lends itself perfectly to all day wear with no worries about spills or leaks. The Super Jennie Reusable Menstrual Cup comes in two different sizes to fit all women. Whether your cervix is high or low, you can get a cup that fits comfortably and protects you all day long. They come in three different colors and all orders include a set of instructions and a cloth carrying bag. 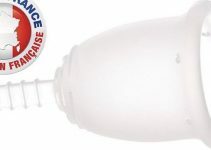 All cups are manufactured in the United States and made from medical grade silicone. It will never cause an infection or leak, as long as it’s properly cared for according to the company’s specifications. A full set of care and usage instructions can be found on the website. The material is soft to the touch and very springy. This makes it very easy to insert and remove the cup whenever necessary. The springiness ensures that it will always pop back to its original shape and securely seat itself right next to the cervix. You can wear it all day long without ever feeling it once. The material does a great job of being secure and never causing any leaks or shifting while being used. The design and material are both of the highest quality, making a product that simply does its job well. The Super Jennie Reusable Menstrual Cup comes in two different sizes to ensure that it fits all body types. Made in the United States of America for superior construction and protection. Created from medical grade silicone. Easily available for purchase online. The stem is short and rounded for greater comfort and ease of removal. The capacity of the Super Jennie Cup is larger than most other products on the market. The material is FDA approved. The cup is free of any BPA or dyes. There are three different colors to choose from with the purchase of any Super Jennie Menstrual Cup. After choosing from the two sizes, the colors are blue, teal, and clear. Cups can be bought as singles or in packs of two. Each cup comes with one instruction manual and one cloth Super Jennie storage bag. Cleaning the Super Jennie Reusable Menstrual Cup is very easy. You can make sure that your cup is always clean whether you’re on the go or at home. Wash your hands with warm, soapy water before and after insertion and removal. Remove the cup and empty the contents down the toilet. Wash the cup in warm water with scent free soap. Wash your hands with warm, soapy water before entering a public stall. Remove the cup and flush contents down the toilet. The Super Jennie Cup should be sterilized at the end of each cycle, and nothing could be easier. All you need is a pot of water on your stovetop. Drop in the cup and let it boil for 5-10 minutes. Remove the cup and let it dry. Once cool and dry, place the cup into the cloth Super Jennie storage bag and store it away until your next cycle. Super Jennie launched in December of 2014 and has steadily grown in popularity. The company is based in the United States of America and takes the environment very seriously. It was concerned with the vast amounts of waste created by sanitary pads that led to the creation of the products. In a world of technology and innovation, feminine care should be a part of the constant state of evolutions where we find ourselves. Customer feedback for the Super Jennie Menstrual Cup is overwhelmingly positive. Many women talk about how discovering it has changed their lives for the better. While some have difficulty in inserting and removing it at first, a little experience makes all the difference. A large number of women love the fact that the cup holds so much liquid. The small size makes it seem impossible, but being able to get a full night’s sleep without having to worry about removing it is all the proof they need. Once women try it once, they’re hooked on the cup for life. No, the stem of the Super Jennie Reusable Menstrual Cup is small and rounded, so it doesn’t need to be trimmed at all. Can it be purchased in two packs? Yes, you can purchase your cup in both one and two packs, and in three different colors. Can I use the cup if I have an IUD? Yes, it can be worn safely with an IUD. It won’t cause any interactions or infections when used properly. Is the cup too soft to insert and remove? No, the cup is just right. According to the women who use it, the material is soft enough to not be felt during wear but springy enough to easily fold and insert. Can it be used during post-partum bleeding? No, it cannot. 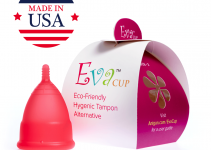 No menstrual cup should be used for at least 4-6 weeks after giving birth. No, the material doesn’t absorb any of the menstrual fluid. This means that it also does not absorb any smells or odors.